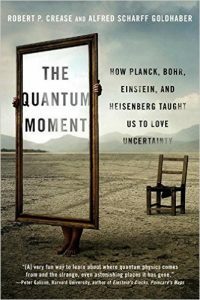 On the train yesterday I finished an enjoyable book, The Quantum Moment: How Planck, Bohr, Einstein and Heisenberg taught us to love Uncertainty by Robert Crease and Alfred Scharff Goldhaber. It’s the book of a course this philosopher and physicist teach to students who are a mix of humanities and science majors, and it concerns the interactions between discoveries in physics and the wider culture. Now, I must confess that, despite the simplification here, I still don’t understand quantum mechanics, condensates, entanglement and all that jazz: it feels like my brain can almost grasp what’s going on but despite straining can’t quite get there. I’m not alone but at least I don’t pretend; the book has nice examples of ‘fruit loopery’, meaningless claims of spurious authority based on the impressive sound of quantum terminology. The idea of there being no ‘out there’ outside the model, from which an expert and impartial observer can analyse everything, has obvious resonance for a social scientist. But let’s not pretend to do quantum economics. Even so, the book is convincing in its argument that the Newtonian world (as imported into culture) of straightforward cause and effect has been replaced by a more uncomfortable world of ‘gaps, inconsistencies, warps and bubbles’. 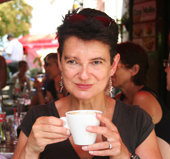 The authors think this is a good thing – perhaps it prefigures a ‘new humanism’ they suggest. Hmm. I’m not so sure about that. But I would agree that: “Understanding and appreciating quantum language and imagery – along with the ability to recognise its misuse in fruitloopery – is part of what it means to be an educated person today.” But is there any truly accessible explanation of it for the non-physicist?